This variety has a different taste than the Spike's Ultra. If you are currently using Ultra and wish to change to the Delight, please be sure to mix them together for the first couple of days. 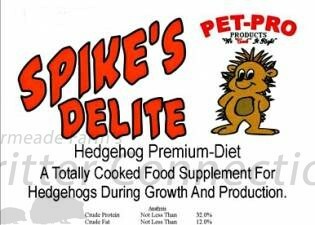 A totally cooked food supplement with chicken, whole soy and fish protein sources for hedgehogs. Along with minerals and vitamins, it provides specific nutrition for the young growing animal and/or for reproduction, as well as adult hedgehogs. Chicken meal, extruded yellow corn, soybean meal, extruded brown rice, fish meal, steam-rolled oat groats, extruded whole soymeal, soy hulls, vegetable oil, Brewers yeast, whole dried egg, blood meal, potassium chloride, salt, magnesium sulfate, potassium sulfate, choline chloride, calcium carbonate, Vitamin A acetate, D-activated animal sterol (source of Vitamin D3), DL-Alpha Tocopheryl acetate (source of Vitamin E), Menadione sodum bisulfate complex (source of Vitamin K), Vitamin B-12 supplement, calcium pantothenate, niacin supplement, riboflavin supplement, pyridoxine hydrochloride, thiamine mononitrate, biotin, folic acid, ferrous sulfate, zinc oxide, zinc sulfate, maganous oxide, manganese sulfate, copper sulfate, calcium iodate, dried lactobacillus acidophilus fermentation product, corn germ meal, dried kelp, dried tomato pomace, vinegar, yeast culture, monosodium phosphate, sodium sulfate, ferric sulfate, magnesium oxide, cobalt sulfate, cane sugar, DL-methionine, ferrous fumarate, sea salt, l-lysine, lecithin, Vitamin E Supplement, potassium iodide, beta carotene, zinc methionine complex, hydrochloric acid, yucca schidigera extract, algae meal, diatomaceous earth, cobalt choline citrate complex, ferric choline citrate complex, calcium pantothenate, copper choline citrate complex, sodium selenite, magnesium amino acid chelate, zinc amino acid chelate, calcium amino acid chelate, iron amino acid chelate, manganese amino acid chelate, copper amino acid chelate, cobalt amino acid chelate, thiamine monoitrate, ferrous carbonate, hydrated sodium calcium aluminosilicate, peppermint, violet leaves, garlic, alfalfa, horseradish, parsely, dandelion, geranium, ginger, juniper (berries), elder flowers, hops, licorice, clover, tocopherol, amylase, cellulose, maltase, phytase, protease, lipase, mixed tocopherols, citric a acid, ascorbic acid, rosemary extract.